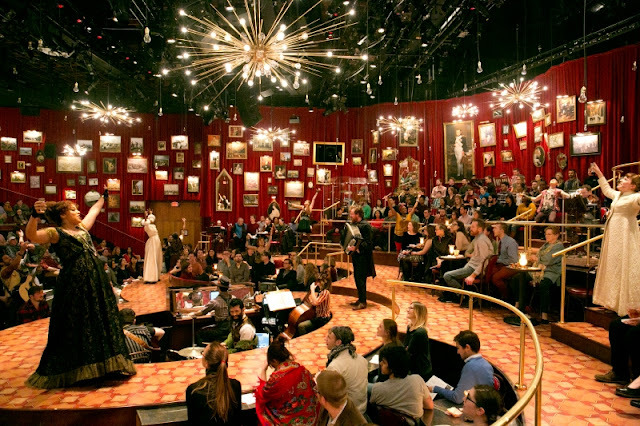 Foreground: Lilli Cooper & Brittain Ashford; Center: Scott Stangland in "Great Comet of 1812"
Alchemy is afoot in ART's current production, the much-acclaimed “Natasha, Pierre and the Great Comet of 1812”. It transforms Tolstoy's iconic story of love and fate, “War and Peace”, into a living, breathing musical work. Based on Volume I, part five, fewer than seventy pages, it is reputedly word for word (with a few updated observations) from the 1922 translation by Aylmer and Louise Maude. It premiered in October 2012 at Ars Nova off-Broadway, then transferred as a pop-up in a tent called the “Kazino”, in the style of a speakeasy, in New York's theater district. It won the Obie Award for Best Musical, as well as three Lucille Lortel awards (with a record-breaking eleven nominations). At ART, gloriously transformed into a Russian style supper club (and more about this later), it continues its triumphant success. As wondrously helmed by Director Rachel Chavkin, with sublimely integrated Choreography by Sam Pinkleton, it's once again the mesmerizing tale of the Russian aristocracy, centered around Natasha's affair with Anatole, and with Pierre's ever-growing despair. One hesitates to use the “o” word lest potential patrons be scared off, but it is through-composed, thus indeed an opera, though an electropop one, with Russian folk, classical, indie rock and electronic dance music. Apart from one spoken line of dialogue near the end, all the lines are sung, many in the recitatif manner of more traditional operas. As a wondrous amalgam of musical styles, an integrated potpourri rather than a hodgepodge, this work offers something for everyone, at one and the same time creating spectacle and intimacy, opulence and poverty, reverence and irreverence, hypocrisy and innocence, the historic and the anachronistic. There is no Comet of 1812 Overture, but a sung Prologue, which introduces the principal characters in a tongue-in-cheek homage to such cumulative songs as “The Twelve Days of Christmas”. As the play begins, Natasha (Denee Benton), engaged to Andrey (Nicholas Belton), who is away in the war, is urged by her cousin Sonya (Brittain Ashford) to visit Andrey's family, which consists of his spinster sister Mary (Gelsey Bell) and their crazy father Bolkonsky (also played by Belton). While that doesn't go well, things become more intriguing for Natasha when she's introduced, at the opera, by Helene (Lilli Cooper), who is married to Pierre (Scott Stangland), to the impossibly dashing (and, unbeknownst to her, infamous lady's man) Anatole (Lucas Steele). The first trace of electronic music begins at his entrance, electrifying the room. Complications ensue when she's seduced by Anatole. After a night of drinking with Pierre and their friend Dolokhov (Nick Choksi), culminating in a duel no less, Anatole convinces Natasha to elope in a troika driven by Balaga (Paul Pinto). This escape is thwarted by Natasha's godmother Marya D. (Grace McLean), who's aware that Anatole has secrets (namely, he's already married). Needless to say, all doesn't end well, at least on the surface. But there is Pierre's embracing of the wounded Natasha who finally smiles (hinting at their future relationship). And there's that titular comet, which transfixes Pierre in an epiphany. Throughout the play, there is a pervading sense of love and respect for Tolstoy's novel, which he preferred to call a philosophical discourse. As Pierre wrestles with profound themes, we are reminded, as Chavkin has noted, of the partying aboard the sinking Titanic as we witness the divine decadence of it all. It has echoes of “Nicholas Nickleby” and “Hamilton” (no faint praise this), not just in its acutely accurate portrayal of society, but also in its immersive and enveloping non-stop energy and exuberance. There are occasional moments of audience involvement, never overdone, and meticulous attention to detail, such as Sonya's making of the sign of the cross in the Orthodox manner (“backwards”, as it were), Bolkonsky's constant tremor, the subtle integration of lighting and sound effects, and the distribution of authentic pelmeni (mashed-potato-filled dumplings) to the audience. Tolstoy wrote that great events in history come as a result of many smaller events driven by thousands of individuals, not by so-called heroes. Thus it's entirely appropriate that this “Comet” is illuminated by an extraordinary ensemble. While they cheekily sing “everyone's got nine different names” and describe one character as “not too important”, the truth is that every member of the cast is integral and integrated. This is not to say that there aren't plenty of great moments created by the exquisite Benton, the passionate Stangland, the comically narcissistic Steele, the stalwart Ashford and the lascivious Cooper. Standouts are Benton's lovely “No One Else” and Cooper's lusty “Charming”, as well as Ashford's astonishingly well-acted “Sonya Alone”, and Stangland's incredibly touching “Dust and Ashes” (apparently added since the CD recording) and “The Great Comet of 1812”. There's not an instant when this cast isn't compelling. The same could be said for the creative elements, from the magnificent Music Direction by Or Matias and Music Supervision by Sonny Paladino, to the ingenious Costume Design by Paloma Young, to the intricately coordinated Lighting Design by Bradley King and Sound Design by Matt Hubbs. But, grand as all of these elements are, there are two fundamental keys to this show's success: the multifaceted contributions by Dave Malloy, who created the Music, Lyrics, and Libretto, as well as, crucially, the awe-inspiring Orchestrations; and the literally breathtaking Set Design by Mimi Lien. Malloy is extraordinary. In his entire libretto, there is but one spoken line, in Pierre's final scene with Natasha, when he declares: “If I were not myself, but the brightest, handsomest, best man on earth, and if I were free, I would get down on my knees this minute and ask you for your hand and for your love”. Otherwise, it's a fascinatingly complex concoction of styles, including some rather arcane musical elements, such as “hocketing”, a vocal technique wherein singers “stack” their voices in patterns that evoke the pulsing of organ stops, defined as “a medieval musical composition in which two or three voice parts are given notes or short phrases in rapid alteration producing an erratic hiccuping effect”. If that sounds too lofty, not to worry. The score is so seamless you need only sit back and let it flow over you. Reflecting her background in architecture, Lien's magic begins even before you enter the overwhelming red velvet supper club with its distressed deterioration. The audience first must pass through passageways that intentionally evoke Frank Lloyd Wright's use of small entries leading to stupendously impressive large venues. As Lien states, after walking through what's intended to evoke an abandoned 1980's concrete bunker, you enter a rapturously decorated room with hundreds of frames containing paintings, mirrors, and even a few pictures of Napoleon (reflecting the fact that he had first been an ally of Alexander I, but this is five years into the Tsar's reign, after they'd fallen out). Complete with chandeliers that are intentionally identical to those found in Lincoln Center, the set is a visual masterpiece. Despite this embarrassment of riches, with emotions often expressed through visual and musical imagery, one leaves wishing there was more about Pierre's own passions and spiritual struggles to become a better person and his notion of the “elusive nature of earthly happiness”. Thus it comes as great news that Pierre's role had been expanded prior to the announced Broadway opening next fall (no surprise here), with Josh Groban in the role, no less. This show is, in short, a stellar spectacular, enlightening in every sense of the word. Score it as a ten out of ten for the show (but only one for the pelmeni). But don't wait for it. This is one speakeasy that won't be a secret for long, so you'd be well advised to procure tickets ASAP. Just tell them Tolstoy sent you. And he does, he does. Neil McGarry in "A Christmas Carol"
Until this version. This is not your grandmother’s “Christmas Carol”, but she surely would have loved it. The striking difference that makes this production stand out from all the others is that all the roles, with one brief exception, are filled by one actor. And not just any actor, but the company’s Artistic Director Neil McGarry, so memorable in and as their recent “Hamlet”, now in another demanding, astounding, and charming performance. Under the insightful direction of the company’s Associate Director Ross MacDonald, this “Carol” is worth singing about, for it supplies a crucial voice most other versions miss, namely that of Dickens himself. From the moment McGarry arrives onstage literally carrying the baggage of Scrooge’s life, we’re struck by the incomparably wise and witty language of the author. Where other productions tend to stick to the well-known words of various characters, this one depends much more on the literate beauty and deviously comic viewpoints one appreciated only on the page, until now. Such asides as having “often heard it said that Marley had no bowels, but he had never believed it until now”, or “awaking in the middle of a prodigious tough snore” are hilarious examples. The star of this version is none other than Dickens himself, in the person of the narrator, and in that role McGarry truly shines. 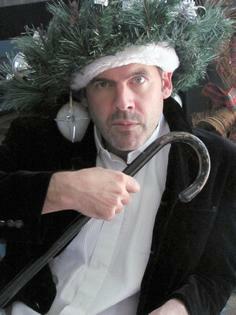 McGarry is not your typical Scrooge, given his youth and good looks, but he manages to convince, with intricate gestures, fluid movement and seemingly infinite facial expressions, not only in the pivotal role of the old miser but in all the supporting roles save one, with wondrous turns as Scrooge’s nephew Fred, the long-suffering Bob Cratchit, and especially the small role of the boy sent to buy the prize turkey. Wisely, avoiding what could have been unintentionally funny, only the love of his young life, Belle, is portrayed by another actor, by the offstage voice of Erica Simpson, who also provides some music and very effective multiple sound effects. With few props (a scarf that doubles as a blindfold, a coat rack that doubles as a Christmas tree, street lamps and a trunk), and an almost bare stage, stripped to its bare essentials, the story has never been so alive and real. To see and hear McGarry exclaim “Oh, there never was such a goose!” is absolutely brilliant. He runs the gamut of emotions from Scrooge’s first horror at the vision of Marley’s face to the uniquely believable transformation at the end. Not only is this performance a triumph of memorization, it’s the most energetic effort seen on any stage thus far this season; at one point, at the Fezziwigs’ ball, one could have sworn there were ten lords a-leaping. Mention should be made that this is a production unafraid to reference the religious meaning of the season, with Dickens’ quote “and he took a child and set him in the midst of them” and “he (Scrooge) went to church” near the end of the storytelling. As Scrooge finally puts it, “I am not the man I was”, and neither are we when reminded of the true meaning of Christmas, especially for those who believe, but even for those who do not. This is “A Christmas Carol” for the ages, and for theatergoers of all ages as well. Anyone who misses this production, to quote Dickens himself, “should be boiled with his own pudding and buried with a stake of holly through his heart”. If you haven’t ordered tickets yet, what the dickens are you waiting for? Angela Brazil in "Heidi Chronicles"
“The Heidi Chronicles”, a play by Wendy Wasserstein, was a watershed theatrical event when it premiered off-Broadway in November 1988, moving to Broadway a few months later. While it went on to win the Tony and Drama Desk Awards, as well as the Pulitzer Prize for Drama and ran over six hundred performances, it was the subject matter of the work that captured universal attention. Hailed as way ahead of its time, it was an on-point but gently skewering feminist event that has outlived its author, who tragically died too young (at only 55) in 2006. 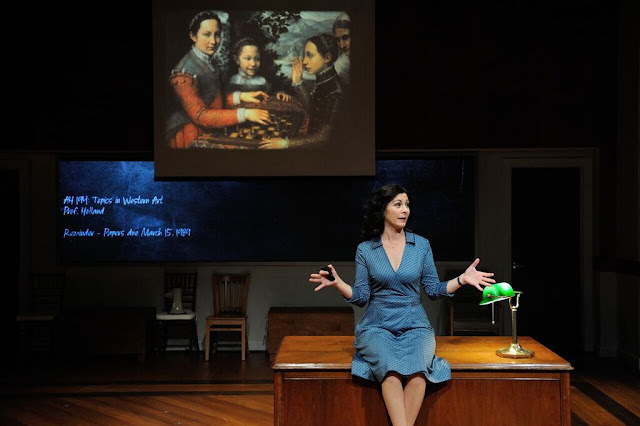 While Wasserstein had other successful plays such as “the Sisters Rosensweig”, “Isn't It Romantic” and “Uncommon Women and Others”, it is Heidi with her chronic wit who has so aptly endured, as evidenced in the current production by Trinity Rep. Humor is sometimes shrewdly effective in making cracks in glass ceilings, and this production is a lovely reminder of the power of theater to inform and entertain at one and the same time. Three decades later, this work, even while showing some creaks here and there, serves to rebuke us for not yet fulfilling its message. The story of the titular art historian Heidi Holland (an excellent Angela Brazil) covers a twenty year span, from her high school years to her highly respected career. Each of two acts begins with a didactic prologue (presumably the “Heidi Chronicles” referred to towards the end of the play) about vastly neglected female painters. Along the way she encounters several characters who will become important to her over the two decades portrayed. At a high school dance with her friend Susan Johnston (Rachel Christopher) in 1965, she meets the closeted Peter Patrone (Charlie Thurston). Two years later she meets the other man destined to be a part of her whole life, Scoop Rosenbaum (Mauro Hantman) at a presidential campaign rally for Eugene McCarthy at which he, noticing her shyness, slyly asks if she is guarding the (potato) chips. Still later, she joins an encounter group, with Susan, run by radical feminist Fran (Anna Miles). Perhaps the best, and most devastatingly true, line belongs to Fran: “Every woman...has been taught that the desires and dreams of her husband, her son or her boss are much more important than her own”. Scoop chooses to marry below his aspirations, and Heidi eventually decides she doesn't need to be married in order to become a mother, somewhat reflecting the playwright's real life; it should also be noted that there are several humorous references to Brown University. Brazil manages to convey the complex character that is Heidi, and both Thurston and Hantman play well off her, as does Christopher, especially as Heidi blossoms (or not). Also appearing in several roles are Ashley Monique Butler, Joe Wilson, Jr. and Rebecca Gibel (especially funny in interplay with Thurston, as talk show host April, though the scene itself is incredible in the bad sense of the term). All are in fine synch thanks to Director Vivienne Benesch. The minimalist Set Design by Lee Savage, Lighting Design by Dan Scully, Sound Design by Peter Sasha Hurowitz and evolving Costume Design by Tracy Christensen (with a recurring emphasis on changing shoe styles) all contribute to conveying a sense of the passages our heroine is making. Benesch has commented that the play remains “fiercely relevant”. But while it's undeniably true that Wasserstein asks some serious questions (as we mature, how do our adult responsibilities affect our youthful ideals? Can one balance career and family? Is it OK to feel sad when our hopes are compromised?) that are still disappointingly evident in our culture today, the play itself frequently reveals how dated its writing is.. The emotionally fragile Heidi, in a famous Act Two monologue (superbly delivered by Brazil despite its excessive length), reveals in anecdotal form her feeling of being stranded, at the same time superior and yet worthless. Still, remarkably for a play dealing with such dated baby boomer issues as Vietnam, much of the playwright's targets are still fodder for discussion. There remain a few missteps, such as a talk show scene straining credulity, and some relatively lame lines (such as Scoop's “I never meant to hurt you”), but by and large the play still succeeds in moving us. As Heidi herself puts it, “all people have the right to fulfill their potential”; that is, as it might be put today, if roadblocks and glass ceilings don't prevent them. And Scoop notes near the end of the play, “America needs heroes”, and, when confronting how sad Heidi admits to being, “unhappy people who open doors usually are”. When he expresses the hope that his magazine, Boomer, will be his chronicle, he reminds her that her lectures were her way of putting women back into the narrative. Heidi ultimately finds hope for a more inclusive future in the daughter in her arms, “a heroine for the twenty-first” century. There are others guarding those chips today, and we must let them fall where they may. Wasserstein herself may rest peacefully; contrary to her fears expressed through Heidi, her work, far removed from worthless, is funny, sad and superior. Phil Tayler in "Buyer and Cellar"
It was a summer night way back in 1964 that this critic first saw Barbra live in the musical “Funny Girl”. (If you have to ask “Barbra who?”, there's no need to proceed further). She was only 22 years old, and this was already her second Broadway musical, her first lead in a show after quite a triumph in a supporting role two seasons prior in “I Can Get It for You Wholesale”. It was also her last lead in a live theatrical production, as Hollywood beckoned, and stage fright took care of the rest. Her turn in “Funny Girl” was the stuff of legend, infecting most of us audience members with that persistent incurable condition known as diva-ticulitis. Hers was easily the greatest display of theatrical presence ever. Until now. Or, at least, there's now a close second in Phil Tayler. 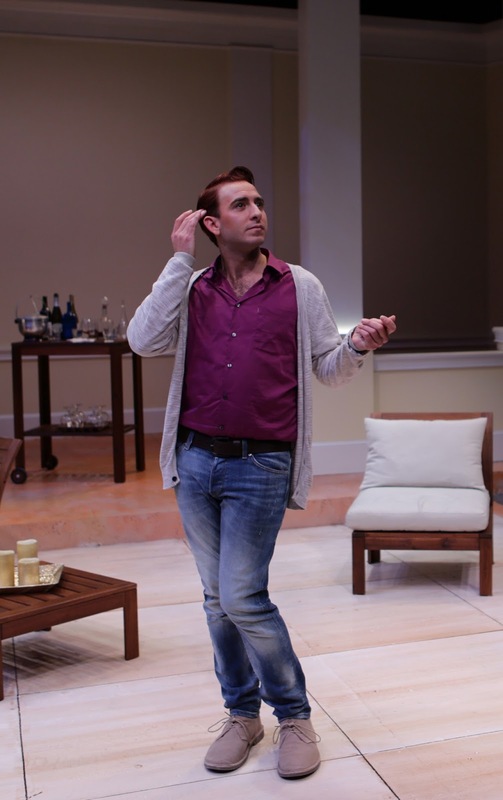 In the current Lyric Stage production of “Buyer and Cellar”, a one-person play by Jonathan Tolins, this locally beloved actor gives the diva a run for her money. As Alex More, he's the sole employee in “The Mall of Malibu”, owned by that certain megastar known simply here as Barbra. Inspired by her coffee table book, “My Passions for Design”, it's a non-stop roller coaster of laughs. La Streisand set the bar high in the Broadway and film versions of “Funny Girl” with the unequivocal song “I'm the Greatest Star”. Tayler states that as a gay man (his character Alex, that is) worshiping her is, after all, “part of my birthright, my heritage” and warns us we'll have to do our parts imagining this stellar cellar designer; he suggests “you can fill in the rest”. Not to worry, folks. His tour de farce performance goes down “like buttah” (with apologies to SNL). This shouldn't surprise. Tayler is no stranger to Lyric Stage audiences, having excelled in about a dozen or so past productions for the company, including “Follies”, “Kiss Me Kate”, “Working”, “On the Town”, “City of Angels”, “Stones in His Pockets”, “Avenue Q” and “Sweeney Todd”. This is to say that we already knew how prolific and versatile this triple threat (acting, singing, dancing) Boston Conservatory grad was, or so we thought we knew. That was before he took on, in this play, portraying Oprah, James Brolin, Beatrice Arthur and.....yes, even Barbra. (He's perhaps best as his boyfriend Barry, a much broader queen). He's got the diva nailed (right down to slightly longer-than-normal nails), as well as all the other characters, and his timing in every one of them is impeccable. It's a joy to watch his every facial expression, his fluid movements, that rather naughty glint in his eye, betraying how much fun he's having performing this role. But not as much as we are. It's extremely rare to experience a show that literally consists, as noted above, of non-stop laughs. It's Tayler's best role ever, and that's saying quite a lot. Attendance at this performance would be the greatest holiday present a theatregoer could give, either to herself or himself, or to others. It's a phenomenon, already the highpoint of this season. Kudos to Director Courtney O'Connor, who's the co-creator of this impossibly hilarious, dead-on portrait. The creative team is in on the gags, from the wise and versatile Scenic Design by Anthony R. Phelps, to the just-right Costume Design by Rafael Jaen, and the perfectly-timed Lighting Design by Chris Brusberg and Sound Design by David Remedios. (And whoever dyed Tayler's locks in Barbra's favorite color). The original off-Broadway all-white-painted version lacked definition, which tempered one's enthusiasm; here everything contributes positively to the overall effect. By the time the whirlwind winds down, Alex has grown to realize that the circle you can make with your arms outstretched contains what's most important in our lives; all the efforts, all the things that surround us, matter so much less; what may matter most is finding someone who knows what to do with one's down time on a Sunday. With just the right partner, you can fill in the rest.